. They are created by the means of light and sound technology interacting with the collective mind. Federation carefully monitor the project.These crop circles are present, in part, to activate the cosmic and soul DNA as well as the physical DNA and expand the brain’s neurosynapses. This happens when they are viewed through the iris and connected to the brain. and codes for these activations. Linking these two images optimizes the activation of the DNA. Allow yourself to take this information in on a cellular level. Do not expect yourself to understand all the aspects and mysteries contained in this transmission. Experience it, emanate it, vibrate with it and ingest it-by doing so, you will serve humanity immeasurably. Combining meditation with the star glyphs and crop circles will assist in the activation of the divine potential to receive this information and activate the creative consciousness within humanity’s collective consciousness. The collective mind is a powerful force that forms the dream field within the third-dimensional reality. The effect of engaging in this process will make quantum evolutionary leaps in the collective mind of the planetary essence. Opening up your consciousness to the patterns, interpretations and transmissions will spark the collective mind. It is most important to remember to come from your heart in all matters; it is the profound power of unconditional love that is the catalyst for all universal transformations. 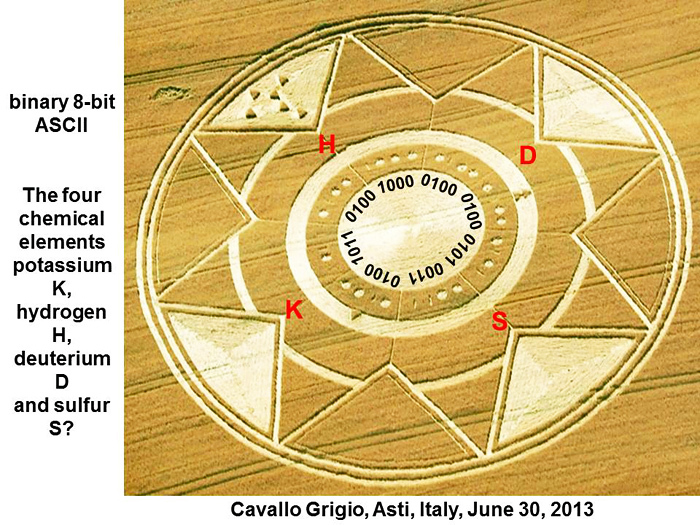 Each person who reads these interpretations and meditates on the star glyphs and crop circles will be assisting in the evolutionary process of the collective mind- heart. Once activated, it will permit the transmission of the technical data necessary to accomplish these various evolutionary processes. We must seed the collective mind with expanded potential. involvement in the dynamics of this precious planet. Crop circles are messages from your star brothers and sisters, who are assisting this multidimensional, evolutionary journey.I would like to advise you that there are other valid interpretations of these crop circles. The scientific community often discovers an equation, a scientific theory or what appears to be an answer to a mystery. Unfortunately, they then set it in stone and claim it is the only answer. The universe does not work that way. There are multilevel facets, interpretation and answers to one single equation or scientific explanation.